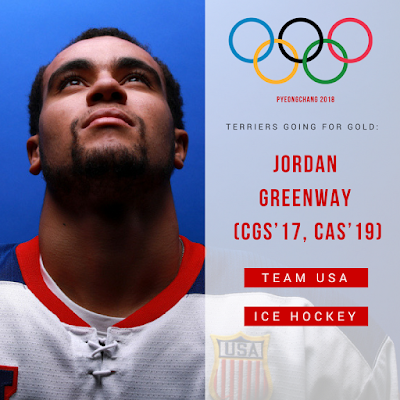 Junior Jordan Greenway left for South Korea Wednesday—on a flight with Harvard’s Ryan Donato—to join the U.S. Olympic Hockey Team, along with former Terriers John McCarthy, Matt Gilroy and Chris Bourque. Team USA will face Slovenia (Feb. 14), Slovakia (Feb. 16) and Olympic Athletes from Russia (Feb. 17) in Preliminary Round games. Before leaving, Greenway spoke with hockey writer Scott Weighart. Prior to departing for the Olympics, Gilroy had a lengthy interview with The New York Daily News about his hockey career, his experiences with Jokerit in the KHL, his marriage to former BU lacrosse star and Fox Sports reporter Jenny Taft and learning that he'd been named to Team USA. The Mack Report's Mike McMahon projects the final Hockey East standings using the KRACH rankings. The projection has BU finishing third, two points behind Northeastern and one point behind BC. Following Monday's Beanpot win against Harvard, the Terriers now sit at #17 in the PairWise Rankings. Matt Grzelcyk picked up a pair of assists—his sixth and seventh—in the Bruins’ 6-1 thumping of the Rangers. A very nice goal for @JackEichel15 on the #NewWavePP. Jack Eichel scored his 21st goal and assisted on a game-tying extra-attacker goal, but the Sabres fell in overtime to Anaheim, 4-3. Eichel reached the 50-point mark and joined Gilbert Perreault, Rick Martin, Phil Housely and Christian Ruuttu as the only Sabres to record at least 50 points in each of their first three seasons. Adam Clendening scored his third goal in Rockford's 3-1 win against San Antonio. 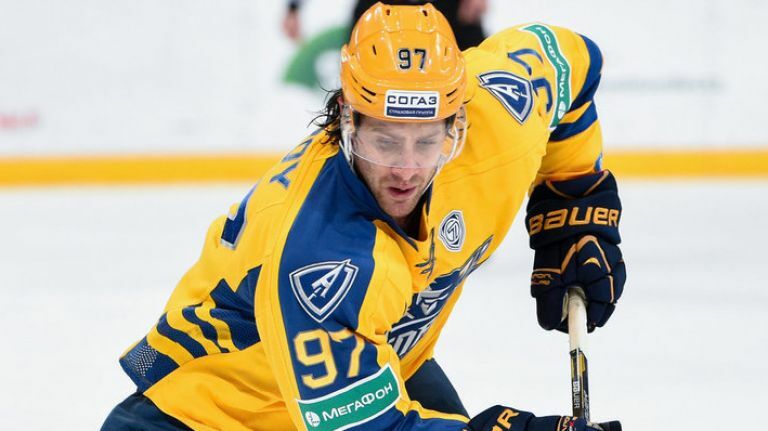 Since being traded by Arizona to the Blackhawks organization (Chicago originally drafted him 36th overall, back in 2011) he has 11 points in 11 games. Senior Victoria Bach’s 98th and 99th career goals and a score by freshman Jesse Compher powered the Terriers to a 3-2 win against Harvard in the first round of the Beanpot. All three BU goals came in a 2:21 span in the first period of the game played at Conte Forum. BU will face BC in next Tuesday’s championship game. Harvard narrowed the lead to 3-1 after one period and added a power play goal in the second, but were unable to produce an equalizer largely due to freshman goalie Corinne Schroeder, who made 24 saves including three exceptional stops in the game’s final minute. Bach is now tied for most goals this season among all Division 1 teams with 34. Senior Captain Rebecca Leslie assisted on two goals to record her 17th multi-point game of the season.